When you're doing your makeup, having clear, clean and even light is a necessity to do and look your best. We know we're not the only ones who've had to squint and peer into the mirror to see what we're doing or encountered themselves in another mirror and spotted hairs not tweezed and foundation not actually as full-coverage as we'd hoped. How Does This Mirror Work and What Does it Do? ​Where can you Buy Them? 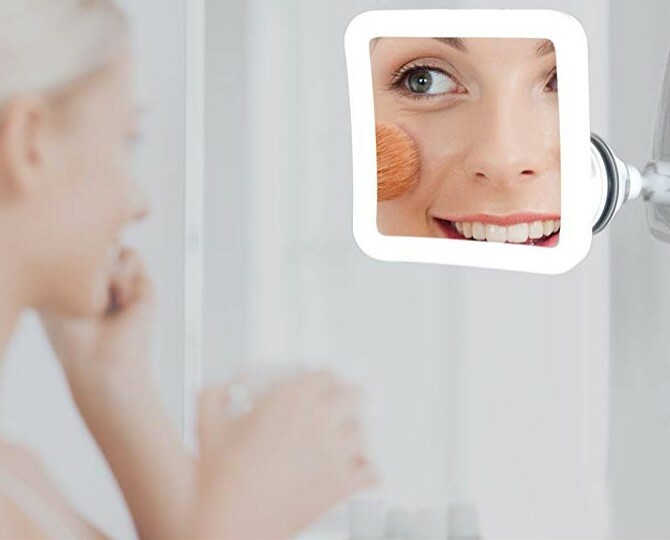 A lighted makeup mirror seems like exactly the solution for better makeup application and skincare. We don't have a magic mirror to tell us which option is best, but we did our research and, after some reflecting, have gathered our top ten best lighted makeup mirror brands. If you're on the hunt for a mirror that's going to show you in your best light, read on! The following products were reviewed based on the following parameters: Features, Pros & Cons, Price, Where to Buy, and Warranty. There are a lot of lit mirror options out there, and a lot of them are not worth your time or money. Additionally, we know that being disappointed by parts of your beauty routine can be infinitely frustrating and made sure we took our time researching different models of lit makeup mirrors to put together a list of what was truly the best. Key features of this product include a tri-fold mirror with 1x, 2x, and 3x magnification, your choice of using batteries or Micro USB for power and the perfect size between "big enough to see everything" and "too big." If you're looking for a mirror with everything, this one sees you. Big House offers a 12-month manufacturer's warranty. Having 2x and 3x magnification alongside the regular mirrors is a dream. It makes it super easy to quickly glance over and perfect details. 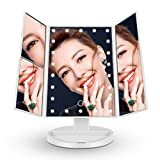 The tri-fold design does double duty both letting you see more of your face and bouncing the light from the central mirror evenly across your face. The size really is perfect. Not counting the stand, when closed it's about the size of an iPad Pro. The lights on the mirror surface can be a little distracting and don't cast as full a light as you'd expect from their brightness. The "base recess" to store tools is shallow and very small, we couldn't find a use for it. Key features of this product include a classic look, both regular and 7x magnification, and beautifully even lighting. Plus, this plug-in mirror comes with a five-foot-long cord, so you won't have to rearrange your makeup area to accommodate it. Conair offers a limited 1-year warranty for this mirror. Conair makes gorgeous products, and this mirror's classic lines are no exception. With 360 degrees of rotation, you can tilt it however you need to see yourself best. The incandescent bulb in this mirror has a shorter lifespan than any LED-lit mirror, and although replacements are available, it's not something you can get at your local hardware store. The mirror is a nice size, and it's great to have magnification, but flipping between the two sides can be annoying. Key features of this product include natural daylight illumination, cordless portability and an amazing range of rotation with a suction cup locking base. If your regular mirror is fine, but you need light and more magnification, this is a perfect match. 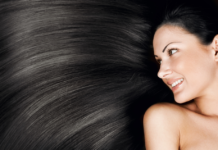 Fancii offers a comprehensive 18-month warranty. The daylight-balanced LEDs mean you'll be applying makeup in bright, natural light that's more accurate to the light you'll encounter throughout your day. The suction cup base means this little mirror is sturdy! 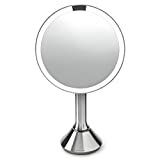 It will stand firmly on just about any surface, and the swivel head means you can also stick it to your bathroom mirror and still see it easily. 10x magnification is amazing for really seeing the details. At only a little over six inches square, this mirror is a little small for us. 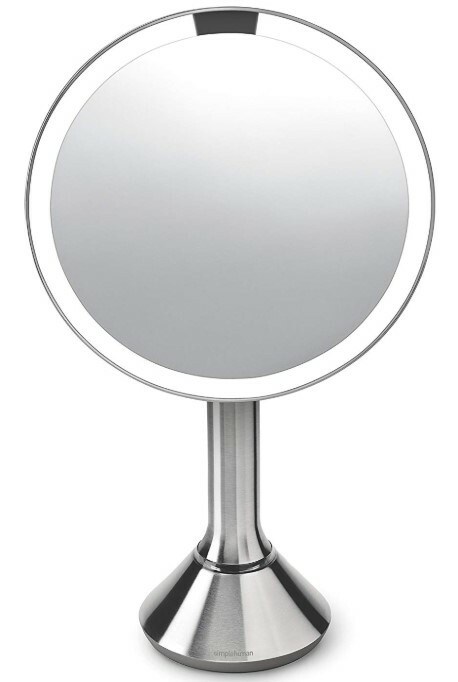 This mirror is only a magnification mirror and works best with another regular mirror. 10x magnification can be a little more magnification than we like for daily makeup application. Key Features of this product include a gorgeous design, spare bulbs for the dimmable LED lights and a couple of different mirror style options. This is the ultimate vanity mirror to make you feel like a star. Chende puts its product packaging through several drop tests to ensure everything will arrive to you in its best condition. They don't have a warranty, but their customer service team will work with you to resolve any issues. The large size and classic design are going to make you feel like a movie star. Dimmable bulbs are wonderful for putting on makeup for nights out, or if you've found most lit mirrors are too bright. Clean white LEDs are easy on the eyes, and the two spare bulbs mean you don't need to worry about replacing one. This mirror is bigger than most options and is best for a dedicated vanity space. The price is higher than for most lit makeup mirror options, and even though it's worth the price, it might not be a match if you're looking for something smaller, more portable, or low-entry. Key Features of this product include a small and travel-ready size with a lightweight and cordless folding design that offers 1x and 5x magnification and bright LED lights. 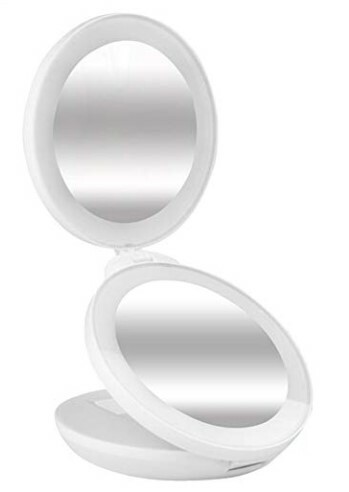 Perfect for checking makeup on the go, this mirror is large enough to hold its own on your makeup table. iLuminate Essentials does not offer a clear warranty on this mirror. Its folding design means it can be tucked out of the way easily, or slid into your purse or bag. The 5x magnification is perfect for seeing details without getting too close for comfort. It's handy travel-ready size can be a little too small. The 5x magnification size isn't lit, which can be frustrating. 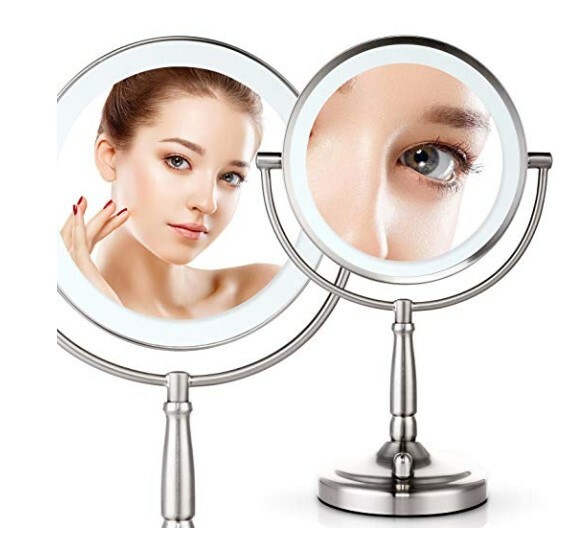 Key features of this product include an easy-to-use touch interface to turn on and control the LED brightness, a removable 10x magnification mirror and a wide 180-degree range of rotation. This mirror has a little bit of everything! Krasr asks to be contacted directly if the product is malfunctioning or defective, but also offer a 30-day money back guarantee if the product is damaged on delivery. Easy to control, dimmable lights, without having to fumble for a cord switch. The 10x mirror can be moved as needed to best suit your routine. ​This mirror is pretty lightweight, so it's not ideal for hard use. The lights are a little dimmer than other brands, and they're on the mirror surface, which makes the light less even. Key features of this product include touchless illumination, surgical grade LEDs that are balanced for the truest and most natural light, 5x magnification and a good range of adjustability. 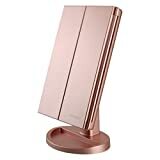 Simplehuman stands behind their products with a five-year warranty on this mirror. This mirror senses your face as you approach and turns on the lights so that you can get started on your makeup without any hassle. An intuitive and easy touch control brightness allows you to adjust the brightness. Has 5x magnification only, which is a great level of magnification, but can feel limiting. All the features can put a drain on the rechargeable battery. Key features of this product include a dimmable light, lightweight design, both 1x and 7x magnification and a size that's big enough to see your face without taking up space. It's perfect anyone trying to do their makeup in small, dark spaces. Miusco offers a 90-day warranty on this mirror. Stand design allows you to flip between regular and 7x magnification as you need. Can run on batteries or plug into the wall, as best suits your space. At a little over six inches, it's a good size but doesn't let you see your whole face at once. Like a lot of simple, battery-powered styles, the light is a little dimmer than we'd like. 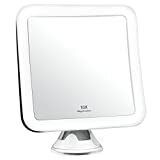 Key features of this product include a tri-fold mirror with adjustable lights on the main mirror and an additional 2x and 3x magnification on one of the side panels. It's a cute little mirror and available in a couple of different finishes. DeWEISN doesn't offer a clear warranty on this mirror. The lights are easily adjustable by holding their power button until they've reached the brightness you desire. Tri-fold mirror makes it easy to see yourself from all sides. No lights on the magnified side is a little frustrating. The mirror stand is a little short, which had us hunching over. Key Features of this product include four easily adjustable light settings, both 1x and 5x magnification and a tri-fold design. With an extra outlet on the mirror for curling irons and other beauty tools and the ability to fold up easily, it's a complete package. This mirror comes with a 1-year limited warranty. The lights on this mirror aren't just dimmable but can be adjusted to daytime, evening, home and office environments. 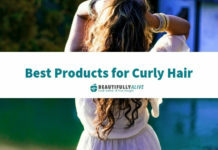 That extra outlet is amazing; it makes finishing up your hair while your makeup sets easy. Even though the brightness isn't dimmable, being able to adjust the warmth of the light is very nice. Has a kind of bulky, vintage looking design (which could be a pro for some folks). The center mirror swivels between 5x and 1x and it can get annoying to scotch the mirror forward to accommodate it. 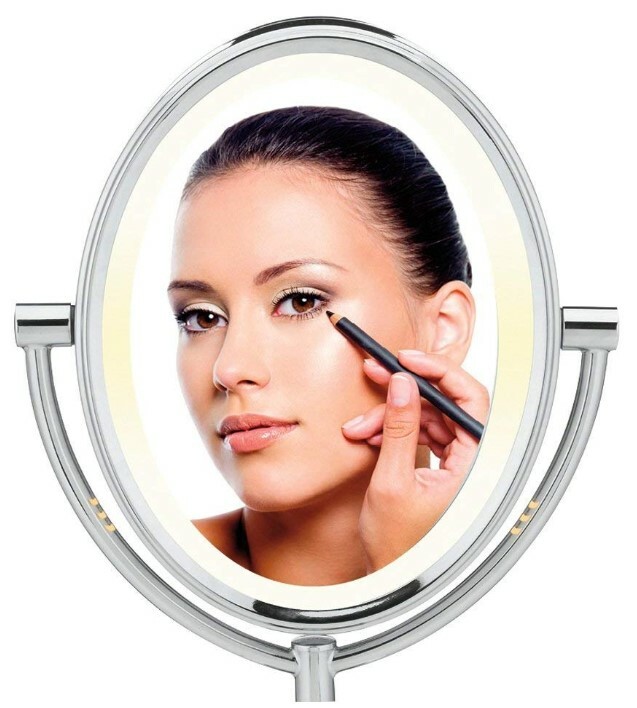 A lit makeup mirror is a mirror ringed by small lights that evenly and clearly light your face. They're like a portable version of the big vanity mirrors surrounded by lightbulbs you see backstage in movies. We want a mirror that lights evenly, is large enough to be useful and isn't a hassle to turn on or use. The last thing anybody wants when doing their makeup in the morning is trying to remember how to get their mirror to work. If it has magnification or different lighting settings, then that's a plus. Let's be honest, many folks make their purchases online for specialty household items. It's easier to buy sight unseen when you can check out a bunch of reviews and lists to find the right match for your needs. 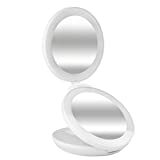 The price range for a lit makeup mirror varies as much as the styles available. 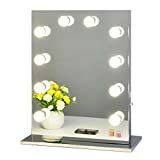 Less expensive mirrors tend to be more portable and battery powered, while more expensive mirrors will be larger and offer more options like dimmable lights. 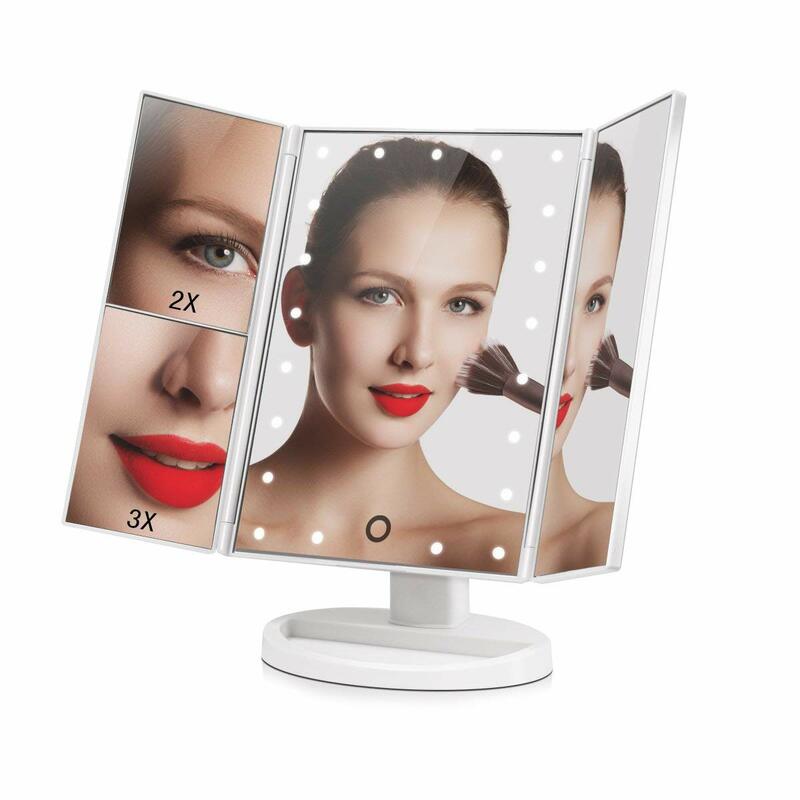 With so many options available, there really is a lighted makeup mirror for everybody. If you're looking for something super portable, or that will fit in a small space, the Folding Travel Mirror With Light is a good choice, with a low price and small size that somehow also packs to magnification levels in it! 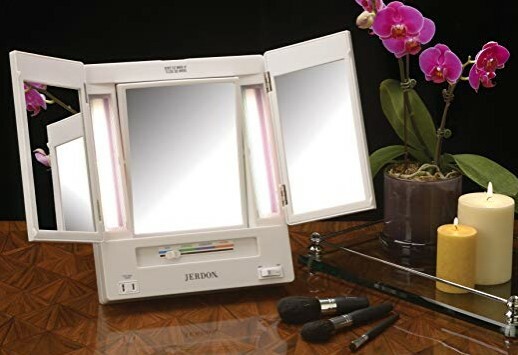 If you need something a little bigger and with more options, the RICHEN DeWEISN Tri-Fold Lighted Vanity Makeup Mirror has the best combo of lighting options, design, and price we found. 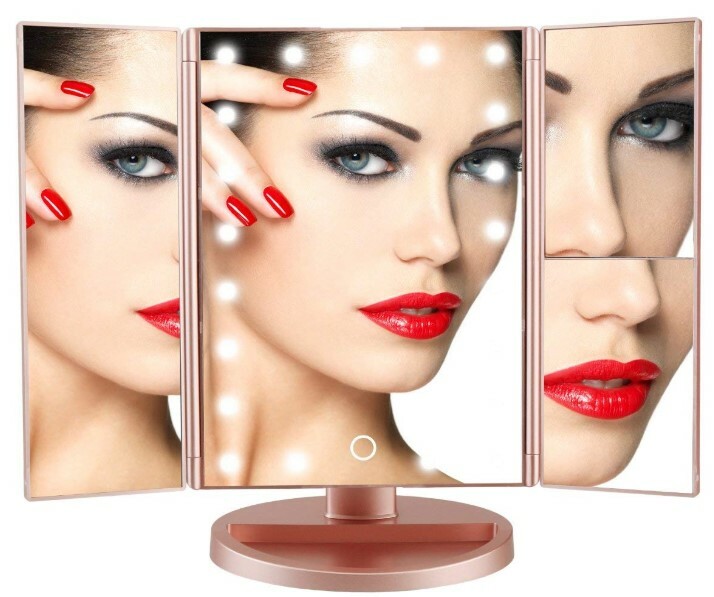 Of course, if you've got the dedicated vanity space, then there is really no option other than the Chende Hollywood Makeup Vanity Mirror for looks, power, and sheer style. 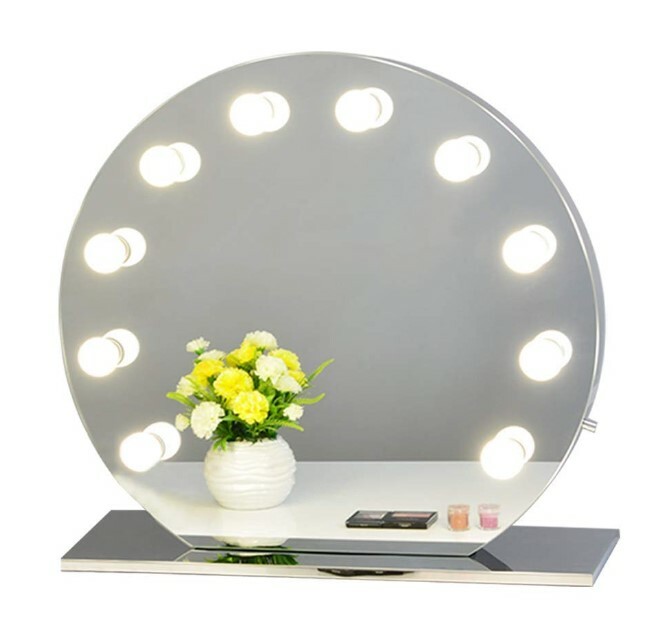 The large mirror and thoughtfully designed lights will offer the best light for your makeup routine.